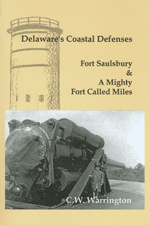 This book details the history of two of Delaware's powerful, yet nearly forgotten, fortresses - Fort Saulsbury near Slaughter Beach and Fort Miles (now Cape Henlopen State Park) in Lewes. Delaware's Destiny Determined By Lewes, by Randy J. Holland, 2013, 152 pp., HARDCOVER Prices reflect the cost of the book PLUS S&H fee of $5.00. Man and Nature in Delaware: An Environmental History of Delaware, by William H. Williams, 2008, 301 pp., PAPERBACK. Prices reflect the cost of the book PLUS S&H fee of $5.00. Notify me of updates to Delaware's Coastal Defenses, by C. W. Warrington, 2003, 158 pp., PAPERBACK. Prices reflect the cost of the book PLUS S&H fee of $3.00.